Every time I go to Sydney, I consider looking up an ex. It’s been years since I’ve seen him and I’m curious. Our break-up wasn’t acrimonious and in fact it was hardly a break-up. We took a break from the relationship due to circumstances, and just never went back. Moving Pictures are playing at the State Theatre on Saturday 30 July and I will be there. Look out for an interview right here with Alex Smith very soon. The universe planned another trip to Sydney to see one of my favourite bands, and provided a catalyst for a reunion with a school friend whom I haven’t seen for about 8 years. But last weekend the universe also made sure my path collided with new friends, while reminding me to honour the past and my loved ones. Saturday 30 April would have been my mother’s 62nd birthday and I was wearing her necklace. I arranged to go to the Middle Eastern Dance Festival with my bellydance teacher and another student. Plans were made to pick me up at the local railway station and I got off at Hurlstone Park station after dutifully texting from the preceding station. At the top of the stairs, a lady asked me where the RSL was and we stared at each other in partial recognition, and she asked if I was from Kempsey. Turned out we were both from Coffs, had met at a class social night about 6 weeks before. The universe had placed us on the same train. When my lift didn’t show up and there was no answer on the mobile, we walked to Canterbury RSL together, made one more phone call to find out that the mobile phone had been left behind, but messages could be passed on and we all met up at the RSL. And the moment I walked into the auditorium, I remembered the last time I had been there. 15 years earlier. With my mother. To see a Jon English show. Mum was with me Saturday night. I am sure of it. The dance concert was brilliant, even if some of the performers made me feel completely inadequate, especially the girl who seemed to be driving the percussion with her body movements. In the Publishing course I did at NSW Writers Centre, I talked to other students and presenters. One lady had connections to Coffs Harbour. One of the presenters is a friend of a friend in Coffs. Even on Monday when I was catching the train out to my brother’s house, I started talking to another lady on the train, and she’d flown down that day from Coffs Harbour. Then when I checked in at the airport today, the attendant told me she was originally from the Mid North Coast and mentioned Coffs, Nambucca and Valla. I’m not sure what to make of the constant Coffs connections that kept popping up. Perhaps the universe is telling me that I’m in the right place. It is very rare that I think I’m in the wrong place. There’s the occasional twinge of nostalgia when I’m wandering around Sydney, or attending professional theatre — a nostalgia for the life I left behind — but I’m not sure I could live there again. Plus the world of theatre and box office has changed so much , that it would take a lot of retraining for me to return to that career. Then again, most of my previous training was on the job, so I could possibly pick it up again. But when I worked in the theatre world, I had no time to write. I was too busy going out to the theatre almost every night of the week. I claim that I was building the life experience to write about later. Now that I live in Coffs Harbour and work in a completely different day job, I have time to write. I’m only an hour away from Sydney by plane and the culture of Sydney becomes a reward, a luxury, a thing to be savoured, rather than something I just take for granted. My trips are fast and furious, and I pack a lot in, but I get the best of both worlds each time: culture and the chance to catch up with family. And then I can return home to the relatively slower pace of the Mid North Coast. Back to my manuscripts and back to the writing life. 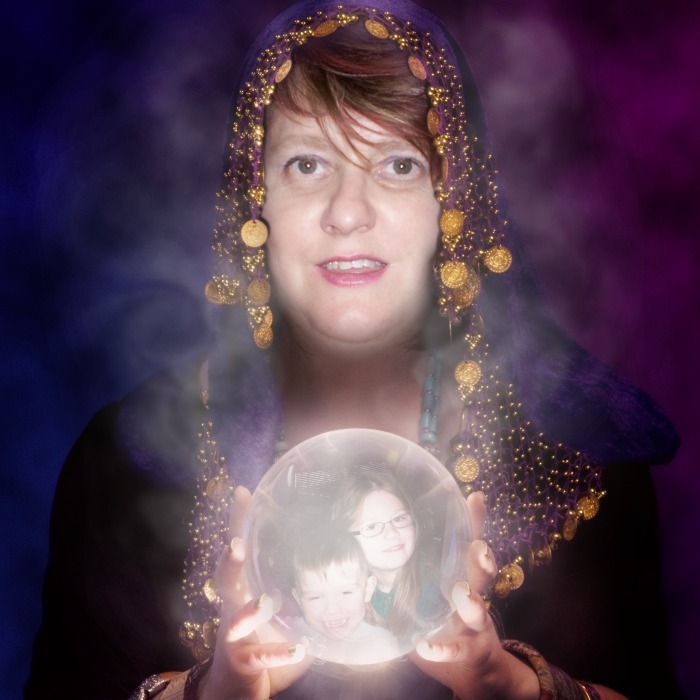 I don’t have a crystal ball. I don’t know what’s going to happen in the future. But the universe knows what it’s doing and I’m going to trust it. ← How much of YOU is in your story? Love the pic at the end, awesome. You made me cry talking about your Mum and gave me goosebumps. I’m so glad you had a great time away.